Our undergraduate students have a variety of opportunities to learn and grow in diverse social and academic environments. 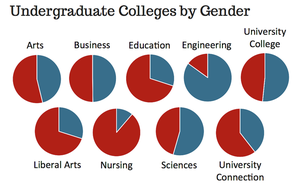 There is also a great deal of gender diversity on campus. 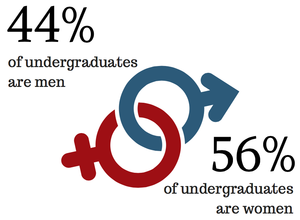 Women make up 56% of undergraduate students, and 44% are men. Undergraduate colleges have varying levels of gender diversity—women are most represented in the colleges of education, liberal arts, and nursing. And the college of engineering has the highest percentage of men. Learn more about our colleges and departments and what makes each of them unique. There is plenty of academic and social support on campus for all of our students, and particularly for our first-time freshmen. 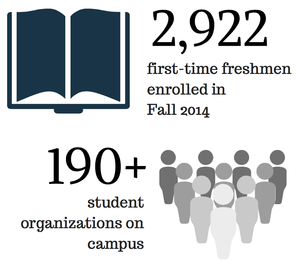 There were 2,922 first-time freshmen enrolled in Fall 2014, and the Office of First-Year Experience provides the resources that they need to succeed. And throughout their college years, many of our students find support from the Academic Success Center and the Department of Special Services. Our undergraduate students are also engaged in a number of student organizations. Check out the Office of Student Engagement & Leadership to find one of the many interest groups that are right for you.